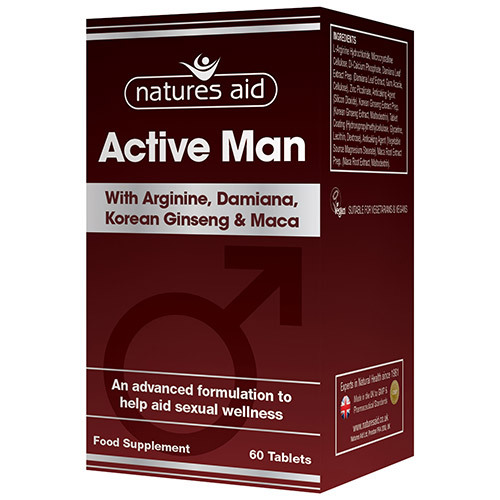 Natures Aid Active Man with Arginine, Damiana, Korean Ginseng and Maca is an advanced formulation to help aid sexual wellness. The level of biologically available testosterone a man has decreases by around two percent per year from the age of 35 onwards. The loss of testosterone can lead to a reduction in libido as well as low motivation, insomnia, mood swings, increased body fat, decreased muscle size and strength and fatigue. It is also recognised that one in four of the male population over the age of 16 has experienced erectile disorder to some degree. Throughout history, men have recognised the value of certain nutrients and herbs for their effect on performance, virility, increasing pleasure and enhancing excitement. 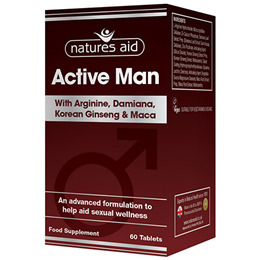 Natures Aid Active Man was developed with these factors in mind to enhance sexual function. L-Arginine Hydrochloride, Microcrystalline Cellulose, Di-Calcium Phosphate, Damiana Leaf Extract Prep. (Damiana Leaf Extract, Gum Acacia, Cellulose), Zinc Picolinate, Anticaking Agent (Silicon Dioxide), Korean Ginseng Extract Prep. (Korean Ginseng Extract, Maltodextrin), Tablet Coating (Sodium Carboxymethylcellulose, Dextrin, Dextrose, Lecithin [soya], Sodium Citrate), Anticaking Agent (Vegetable Source Magnesium Stearate), Maca Root Extract Prep. (Maca Root Extract, Maltodextrin). Take 3 tablets on an empty stomach 1 hour before activity. Below are reviews of Natures Aid Active Man - Sexual Wellness - 60 Tablets by bodykind customers. If you have tried this product we'd love to hear what you think so please leave a review.